ALHB has not been detected in Oakville, however, given the severity of a possible outbreak, the town continues to monitor for signs of its presence. 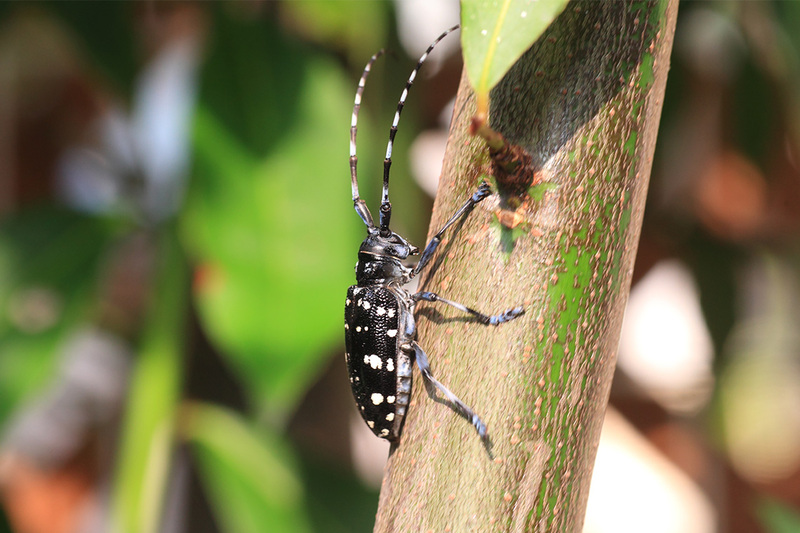 ALHB is a highly destructive invasive insect from China that kills healthy trees, devastating a community’s urban forest. The damage it can cause extends to many broadleaf trees, such as maple, birch, elm, poplar and willow. In 2013, the Canadian Food Inspection Agency (CFIA) confirmed the presence of ALHB in an industrial area near Pearson International Airport in Mississauga. If you think you have seen the beetle or signs of its damage within Oakville, please take a picture if you can and report your findings to the CFIA at 1-800-442-2342. ALHB may be confused with some native insects. Please compare the photos on the CFIA website when trying to identify ALHB. For more information, review the CFIA ALHB Fact Sheet. Based on population levels in 2017, Oakville faced extreme gypsy moth infestation in 2018. The Gypsy Moth is a non-native insect that is considered a major pest in North America. Gypsy moths can be a concern because the larvae (caterpillar) feed voraciously, mostly on the leaves of deciduous (leafy) trees such as Oak. During the larval stage, a single gypsy moth caterpillar can eat an average of one square metre of leaves. After severe or repeated defoliation, trees can die or become so weakened that they are vulnerable to secondary infestations. 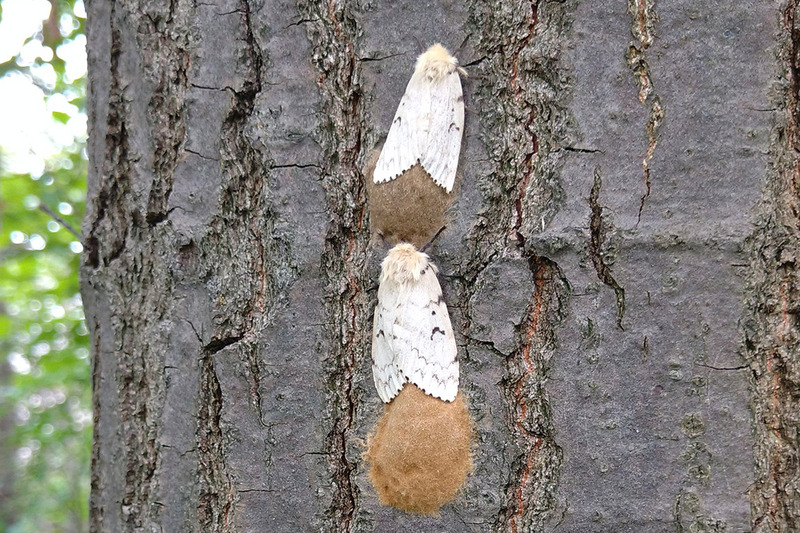 If left untreated, gypsy moth have the potential to impact 409,000 trees in the Town of Oakville. This equals about 23 per cent of the town’s tree canopy. The town successfully completed an aerial spray application of the biological treatment Bacillus thuringiensis Kurstaki (BtK) in the spring of 2018 to control gypsy moth and cankerworm infestation in town woodlands. For more information, visit our Gypsy Moth and Cankerworm page. For more information, review the Health Canada Gypsy Moth Fact Sheet. 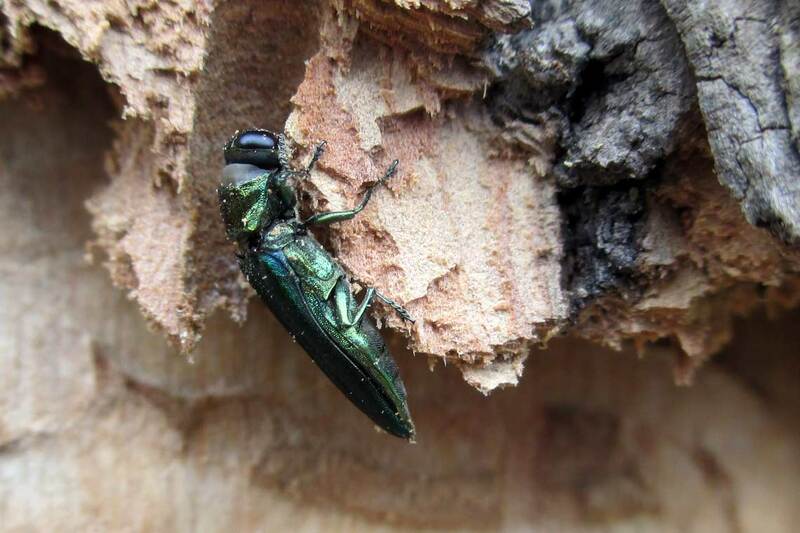 Emerald Ash Borer is an invasive insect from Asia that attacks and kills untreated ash trees. The town has a strategy to manage EAB in Oakville. To learn more about the town’s EAB management program, visit the Emerald Ash Borer page. For more information, review the CFIA EAB Fact Sheet. The town experienced a higher than normal volume of aphids in 2017, particularly on linden trees. 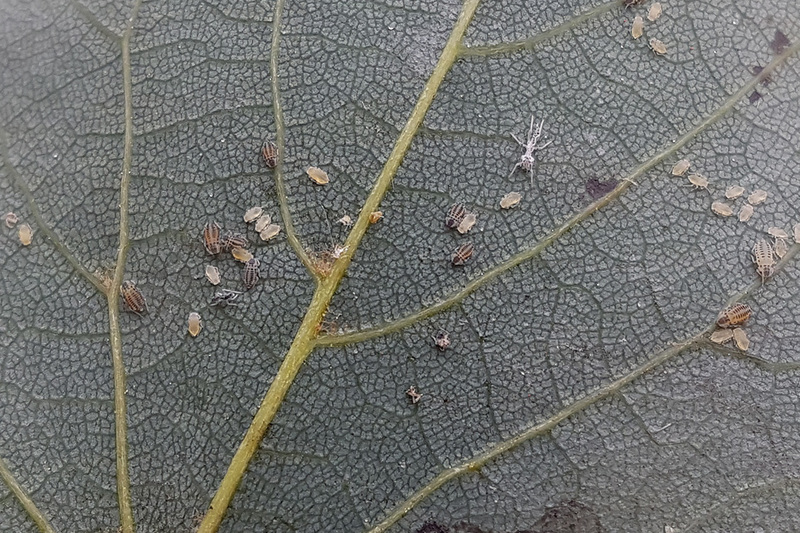 Aphids are native, small, soft-bodied insects that feed on plants and trees by sucking sap from leaves and stems. They excrete a sugary substance called honeydew, which drips down on the surrounding area and promotes growth of a harmless mold that can stain leaves. Populations are at their peak during the late summer, and decline with cooler weather in the fall. Most trees are able to tolerate high populations of aphids and residents should not be concerned about the risk to their trees. Using a hard jet of water from a hose or an insecticidal soap spray (which is exempt from the town’s pesticide ban) can reduce their populations. Avoid using broad-spectrum insecticides as they also kill ladybugs and other beneficial insects that feed on aphids. For more information, review Health Canada's Aphids Fact Sheet. The town experienced a population increase of Cankerworm in spring 2017. Cankerworm, also known as inch worm, is a native insect found throughout the majority of Canada. There are two species of cankerworm, spring cankerworm and fall cankerworm. Cankerworm cause damage by defoliation during the larval stage. Initial feeding causes a shot-hole appearance in the leaves, but advance feeding results in the entire leaf being consumed. Healthy trees will usually survive a moderate single-year defoliation. 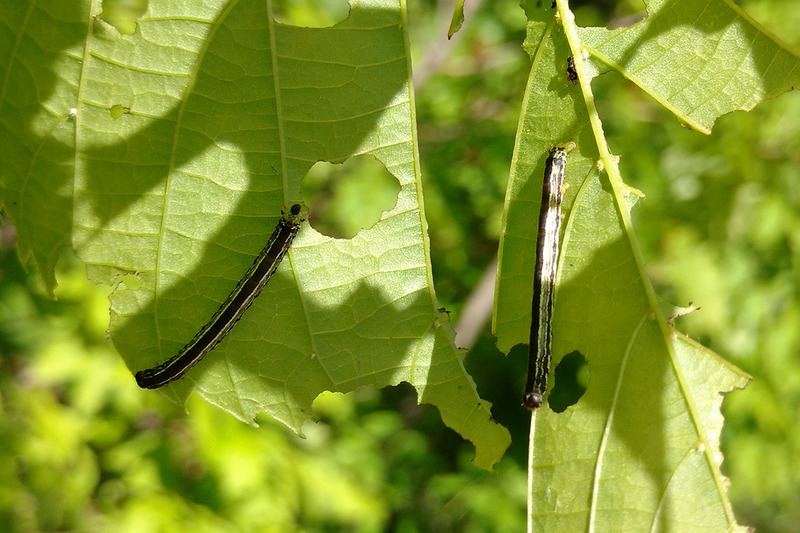 At normal population levels, cankerworm play a crucial role as a food supply for many of the native species of birds that live in Oakville’s urban forest. The town successfully completed an aerial spray application of the biological treatment Bacillus thuringiensis Kurstaki (BtK) in the spring of 2018 to control gypsy moth and cankerworm infestation in town woodlands. For more information visit our Gypsy Moth and Cankerworm page. For more information, review the Agri-Food Canada Cankerworm Fact Sheet. Lyme disease is a bacterial infection spread by the blacklegged tick. Based on the Region’s surveillance of tick submissions and human cases, the risk of acquiring Lyme disease in Halton is very low. Visit the Halton Region’s website to learn more about Lyme Disease. Buckthorn thrives in a variety of habitats and forms dense thickets that crowd and shade out native plants. It produces large numbers of seeds that germinate quickly and can alter nitrogen levels in the soil, creating better conditions for its own growth and discouraging the growth of native wildflowers, shrubs and trees. Since this plant will grow to the size of a small tree, early detection and removal is the best strategy for preventing establishment. Below are suggestions on how to address European Buckthorn on your property. Plants that are bigger than a seedling will need to be dug out with a shovel or removed with a lever tool, such as an extractigatorTM. Place a tarp over cut stems to discourage new growth. Dispose of invasive plants in the garbage. Do not put them in the compost or discard them in natural areas as this causes further spreading. For more information, visit Ontario’s Invading Species Awareness page. 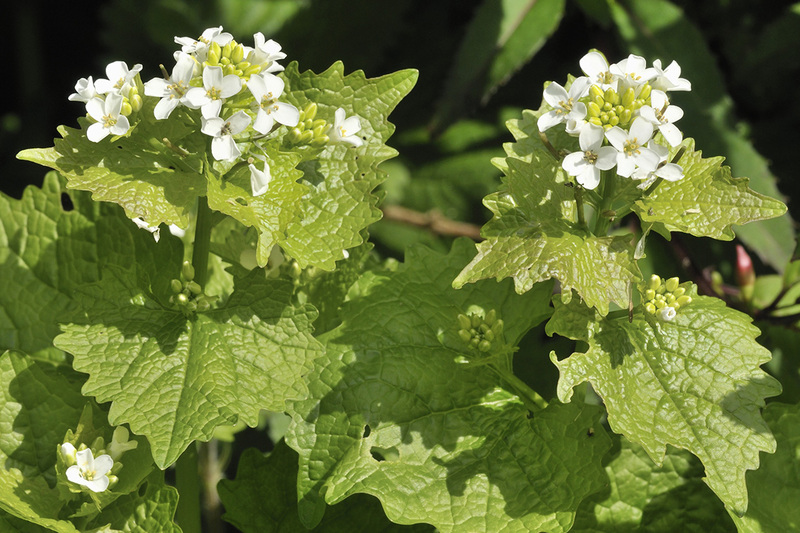 One of the greatest threats to woodlands in Oakville and across Ontario is Garlic Mustard (Alliaria petiolata), an invasive plant that displaces native wild flowers and plants, including White Trilliums. Below are suggestions on how to address garlic mustard on your property. Place pulled plants in garbage bags for disposal and tie shut. Garlic mustard can still seed even after it has been pulled so composting it will transport its seeds… it basically can come back from the dead. After placing in garbage bags, leave in the sun for a couple days before disposing. The Town of Oakville partners with Oakvillegreen to organize Garlic Mustard pulls from town woodlands. For more information on garlic mustard, visit Ontario’s Invading Species Awareness page. Giant Hogweed is a large, invasive plant whose sap contains chemicals that can cause skin to become hypersensitive to sunlight and erupt in painful blisters. Similar to Giant Hogweed, the sap of Wild Parsnip plants can also cause skin irritations, burns, or blisters. 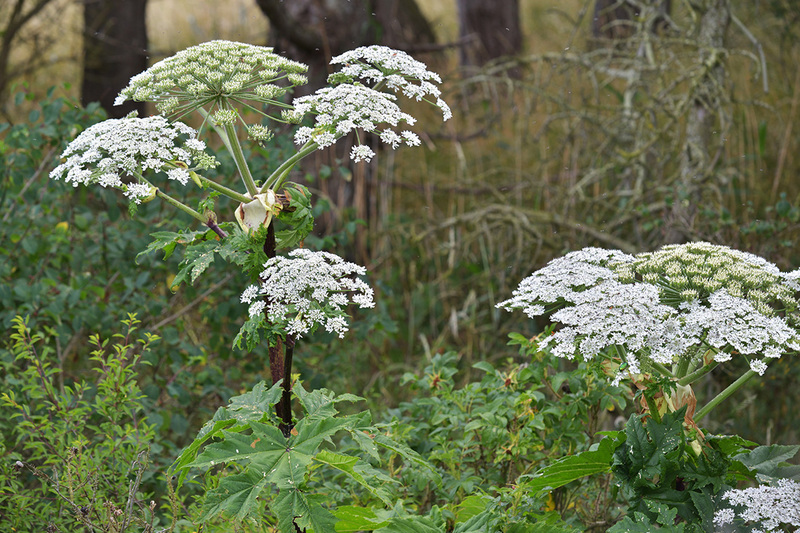 For more information on how to identify Giant Hogweed and Wild Parsnip, visit the Giant Hogweed and Wild Parsnip page.